Unlike the Teochew plain porridge which needs to be accompanied by other dishes, this Cantonese-style congee is more flavourful and briny by adding other ingredients according to your preference and adding seasoning into it. Come, come, come and savour this yummy-licious congee. 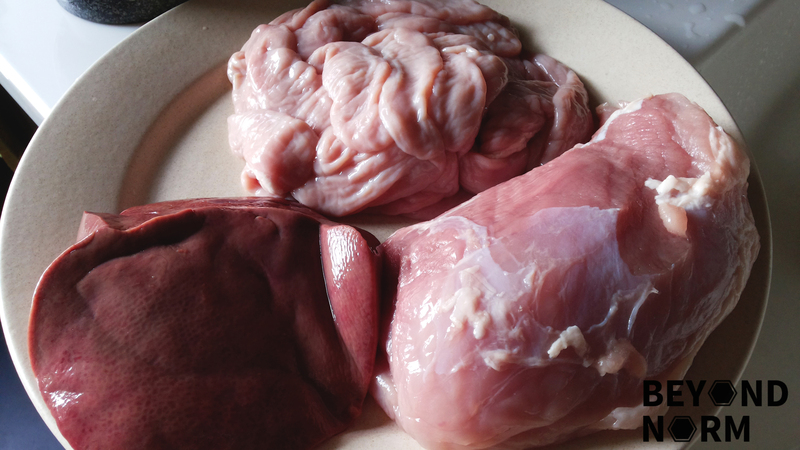 If the intestines you bought needs to the cleaned, please watch this link to find out how to clean them. 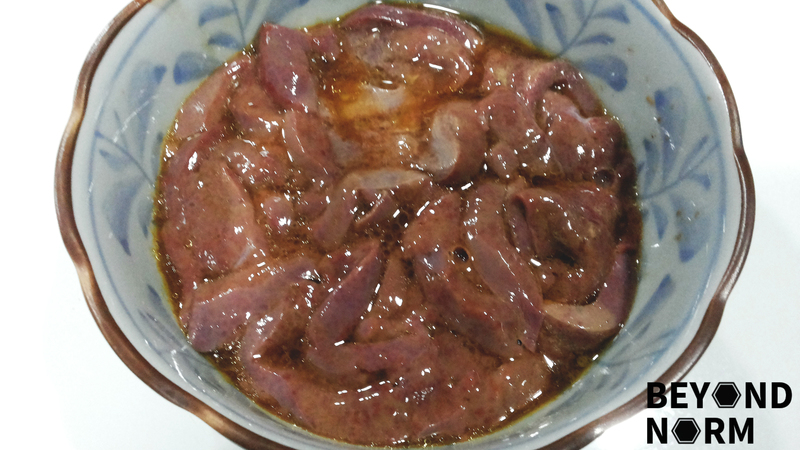 The intestines which I have bought from the wet market were cleaned but I still added 1 ½ tablespoons of salt and rubbed it all over the intestines. 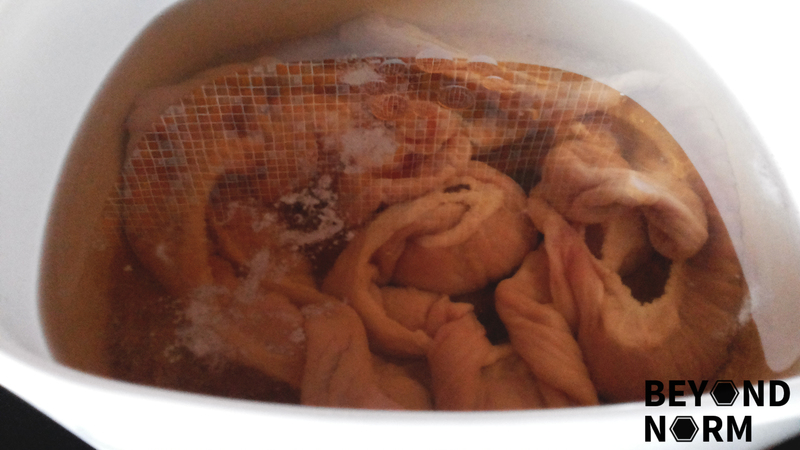 Leave them for 10 minutes and rinse off. Turn the intestines inside out and repeat Steps 2 and 3. Rinse at least 2 to 3 times with water. Transfer them into a pot of water, add 2 tablespoons of light soya sauce, a teaspoon of sesame oil and a dash of pepper and bring to boil. Lower heat and simmer for 20 minutes or till soft. Remove from heat and cut into 3 cm pieces and set aside. Marinate pork slices with seasoning for 30 minutes or longer. Marinate the liver with the seasoning for 30 minutes or longer. When the congee is about ready, blanch pig’s liver slices with boiling water for 30 seconds, or till it’s half done. Drain and reserve for later. Rinse the rice at least twice. Transfer rice into a pot and add 7 cups of chicken stock and sliced ginger and bring to boil over high heat. Reduce to low heat and let it simmer. Cover the pot partially but be on the lookout as the liquid might overflow. Simmer for about 30 minutes or longer to get congee (very fine consistency). Add more chicken stock if needed. Add pork meat slices, and continue to stir and simmer for another 10 minutes. Add some stock occasionally if congee is getting too thick. Add in the cut intestines pieces and the blanched pig’s liver for about 30 seconds. Taste to ensure that the seasoning is to your liking and if needed, you may add a few drops of light soy sauce and sesame oil into the pot and stir to mix well. Crack a raw egg into each serving bowl (optional) and immediately ladle the congee into the bowls. Garnish and serve with a dash of white pepper. New crop jasmine rice is more suitable for cooking congee/porridge as they break down quicker and are softer. The right consistency of successful congee should be fairly smooth, light gluey with enough moisture. To achieve smooth consistency, rice has to be softened till completely emerged with the liquid by stirring it continuously (and mashing the softened rice grain to break it down with ladle occasionally) when simmering. Add water to lighten the texture, if you find some resistance to your stirring. You may replace pork and the innards with other meat such as chicken or fish.